MaxxStrip has multiple applications. One of the best is fountain and pool tile cleaning, which is an extremely safe and effective technique for removing calcium and scale deposits. Unlike other pool tile cleaning methods which involve dangerous chemicals, the results are faster and cleanup is much easier. And, it’s safe to swim as soon as you finish! MaxxStrip blasting media is all natural, water-soluble, silica and toxic metal-free, non-hazardous, non-toxic, and non-sparking. MaxxStrip’s pH is neutral, making it landscape-safe as well. 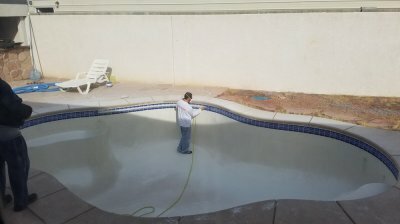 Tile Savers of Nevada will remove calcium from your pool tile by "glass bead" blasting! 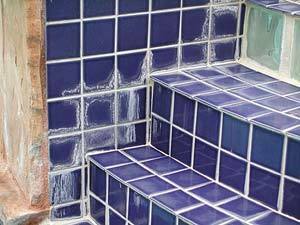 Unlike other methods which involve dangerous chemicals and or abrasive pumice stone which can damage your pool tile, bead blasting is fast, safe and very effective. The cost for most pools with spas average $350 to $450, and no draining is required which saves you more money in water cost. Let us make your pool tile look brand new in less than a day! 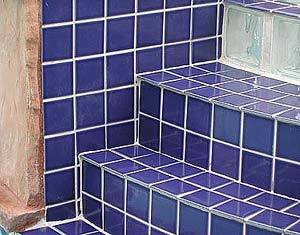 Whether you need a few tiles reset or you want to completely replace that outdated 80's tile, we can help! Your pool will last forever with the proper maintenence, and you may even want to update the style with some new pool tiles. Our ceramic and porcelain tile options are affordable and have many style and color options to make your pool look brand new again. An acid wash is the purposeful stripping of a thin layer of plaster, exposing fresh plaster beneath. Therefore, it is ill advised to make it an annual custom, which will accelerate the need for re-plastering. Most plaster coats (sometimes called whitecoat or marcite) are in excess of 1/2", so a careful acid wash every 5 years won’t hurt.